Lorraine's Garden is back after a little break... I'm afraid a full-time job and a full-time garden made me a neglectful journalist this spring, but I'm happy to be back now! On June 27 I went out to the garden to pick slugs off my collards at 5:30 in the morning. It was light enough to see the slugs, but still dark enough for the slugs to be out in force. But what I found in the garden, besides slugs, was a whole garden full of mating night crawlers. 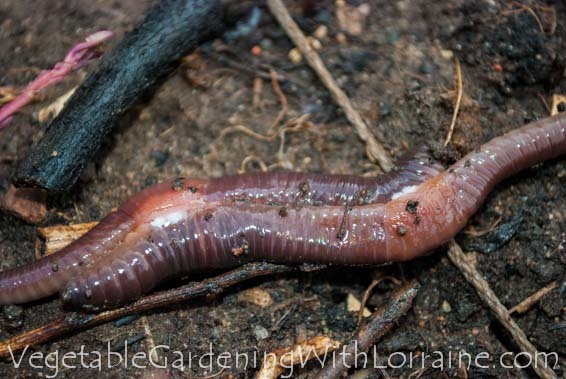 Now the short and skinny of it is that earthworms are hermaphroditic, which means that every worm is both male and female. To ensure genetic diversity, though, they don't self-fertilize. They mate to exchange genetic material, which as you can see in the photo takes place on the surface. Why would anyone transplant carrots? Why not just start them in the ground? Well I found out this year. I had almost a total failure of germination in the garden, because I now have a full-time day job, and it's very hot and dry these days in Denver. No matter how much I soaked the garden in the morning last spring, it was hot enough that the germinating seeds dried up in the heat before I got home. So I did what everyone says not to do. I started carrots indoors in seed flats where it was cooler, and transplanted them out into the garden when they were very little. The trick is to use very fine potting mix, press it down into the flats so that it stays together when you go to push it out, and to transplant as soon as the seedlings have 1/2 to 3/4" seed leaves.